Otherwise known as a Turkish bagel and as the Ottoman’s first fast food. Simit is the busy locals’ go to morning snack. I eat simit almost every morning before I catch the commuter ferry. 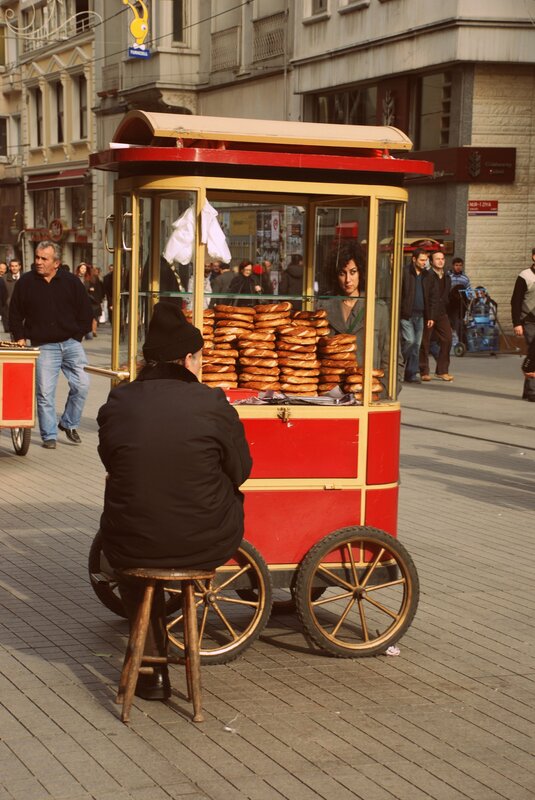 You can see pushcarts selling simit in every part of Istanbul. It is a savory large donut-shaped bagel covered in sesame seeds and baked. 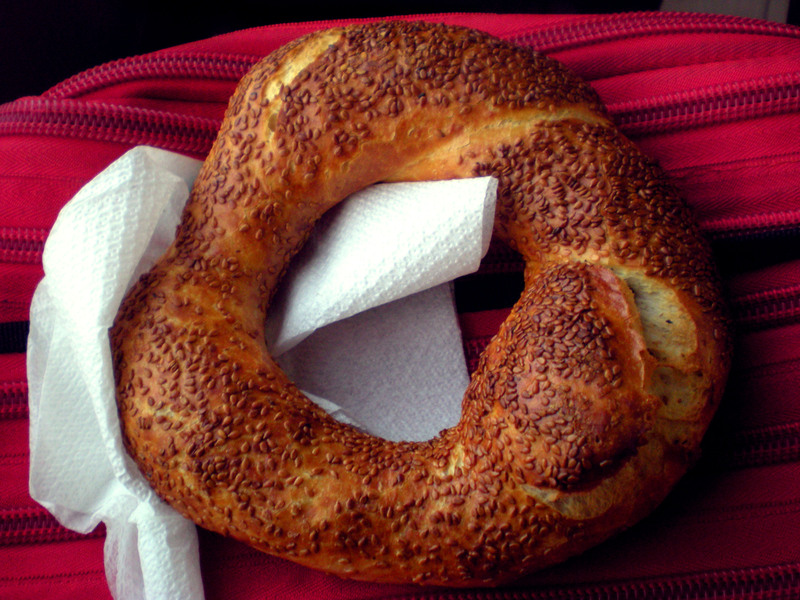 Simit is at its most delicious when it is warm and fresh. And it’s even better when accompanied by a tulip shaped glass of black tea! As you would expect from Istanbul’s geographical location, we are lovers of almost every kind of sea food. If you go to the waterside in Istanbul (I’d recommend Eminönü Pier or Galata Bridge) it is easy to find the traditional balik ekmek (literally ‘fish bread’). It is mostly served as mackerel fillet in a half loaf of crusty bread with an ample serving of chopped salad and optional onions. Rather than just being a tourist gimmick, it is also a meal enjoyed by many locals because of it’s nutritional value and inexpensiveness. For a cheap dinner with a glorious sunset view of Istanbul, the gaudy balık ekmek boats in Golden Horn beneath the shadow of the Süleymaniye Mosque or the little restaurants under the Galata Bridge should be tried at least once. PS: Go even more local and order a şalgam (a popular beverage from southern Turkey made from fermented turnip and purple carrot) with balık ekmek for a rather different, salty taste. Midye Dolma are mussels stuffed with rice, herbs and spices. It is a very typical midnight snack and also one of the most consumed streetfoods in Istanbul. For some, they are even addictive. 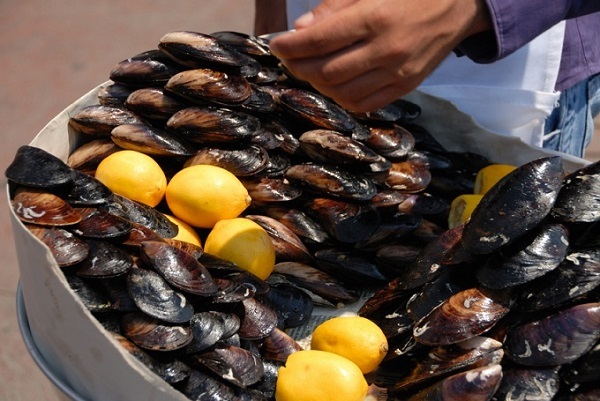 It is possible to see mussel stalls all around the city (especially by the waterside areas). It is delicious, quite cheap and easy to find but it is also important to have your dolmas in a trusted place or street vendor and best avoided during the heat of the summer, if you don’t want to suffer a dodgy stomach. Kokoreç’s preparation begins (and ends) with offal. A lambs innars, along with some fat, are washed and chopped finely. The intestine is cleaned carefully, then rubbed with salt and often soaked in vinegar or lemon juice and water. The filling meats are threaded onto a long skewer and wrapped with the intestine to hold them together. When we think that it is actually made of grilled lamb intestines, it may not sound the most appealing, but remember that it is carefully washed. It is generally served with spicy tomato and green pepper in a quarter or a half loaf of a bread. The common side dishes are pickled peppers or cucumbers. 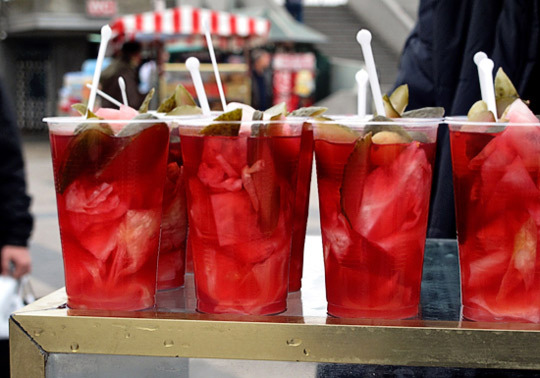 It is also a popular street food in Balkans. It’s usually a great option when you’re homeward bound after a heavy night out. 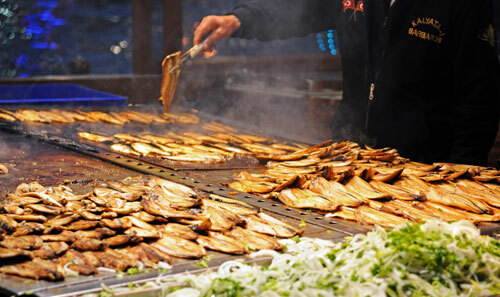 You can also find Kokoreç in some small restaurants but in my opinion the street vendors are tastier. 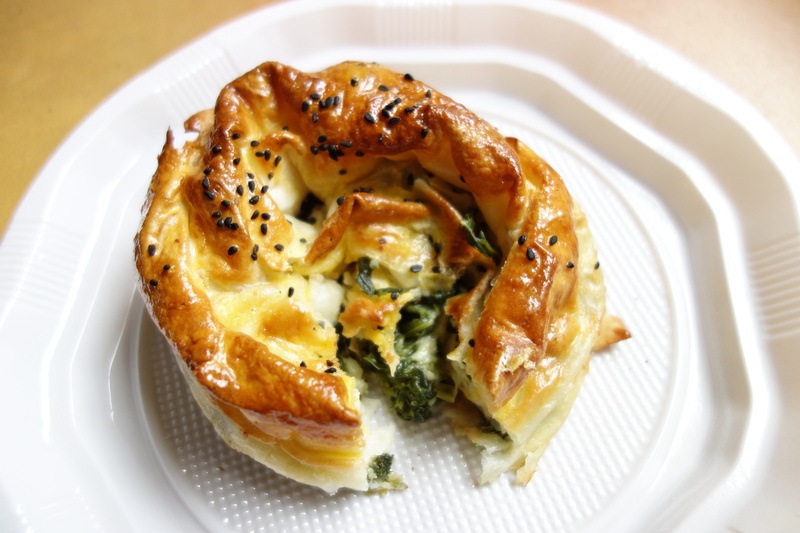 Another common and cheap street food is börek which was popular in Ottoman cuisine. It is a baked or fried pastries made from thin sheets of dough. There are different kinds of börek depending on the shape, the way it cooked and the ingredients it has. The most common types are filled with meat, with spinach, with potato or with cheese. 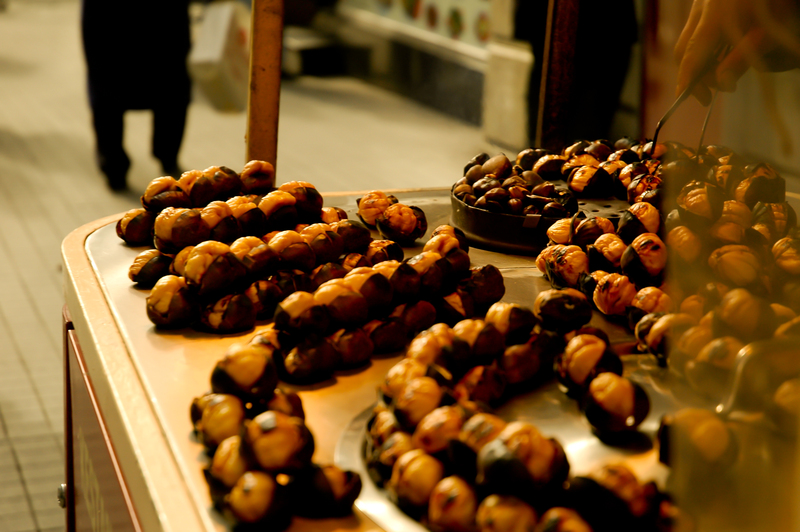 As a filling snack, roasted chestnuts are a delicious and a healthy option. There are lots of chestnut vendors on the streets in Istanbul. In the popular tourist districts like Sultanahmet and Taksim, they needed to be licensed and get standardized from the district authorities. You can buy in different sizes of paper bags (100g, 150g or 400g). Çiğ köfte is a traditional food from southeastern part of Turkey. It is traditionally made from kneading together fine bulgur wheat, onion, tomato, red pepper, various kind of spices and raw minced meat. However, these days laws prevent vendors from using raw meat. So today on the streets and in small restaurants you can only eat çiğ köfte without meat though all the other ingredients are the same. You can eat as wrapped in a very thin bread (lavash) with salad and pomegranate sauce or simply served in a piece of crispy lettuce. This is a typical Turkish fast food. It is very easy to find köfte ekmek vendors, just follow the smell! It is a portion of grilled meatballs with lettuce, onions and pickles wrapped in either a very thin bread (lavash) or served in a half loaf. For the locals, köfte ekmek is also a prevalent meal when you are in a rush or want something cheap but filling. As a typical inexpensive local meal, nohut pilav is basically rice with chickpeas. Sold generally in glass carts and mostly bought by drivers as a tasty, warm and inexpensive meal which you can find by the side of the road. 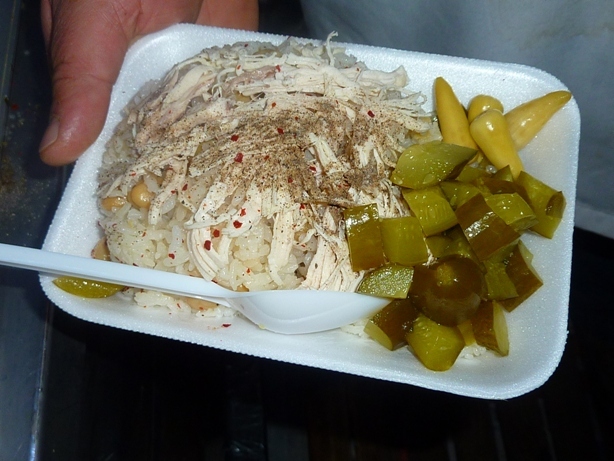 You can also have it with shredded boiled chicken (optional) and I would recommend that you add black pepper on top. 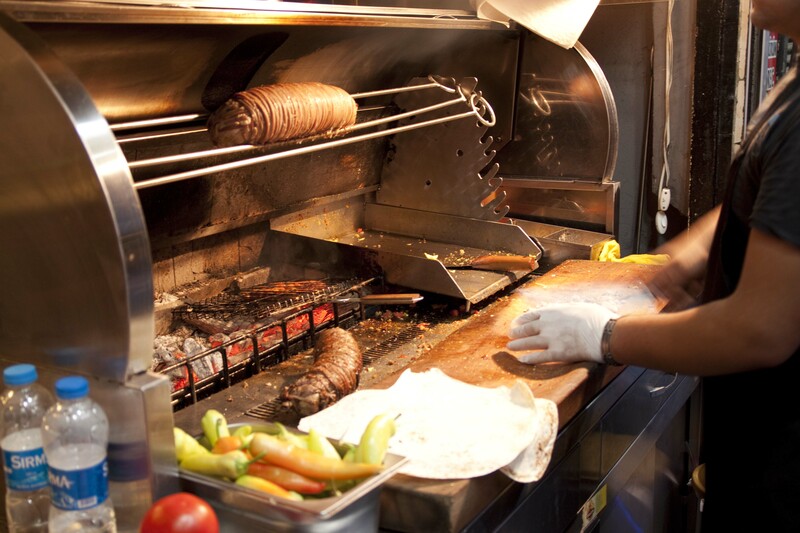 Döner is probably the most famous Turkish food all over the world and also very popular with locals. It is mostly made of either lamb meat or chicken. Döner is cooked on a spit. Slices of döner are chopped into thin slices with a sharp knife by döner ustas (döner masters). Döner is generally served with peppers, tomatoes and onions in half-bread sandwich or wrapped in a very thin bread known as lavash. You can also have it in a plate with rice on the side. 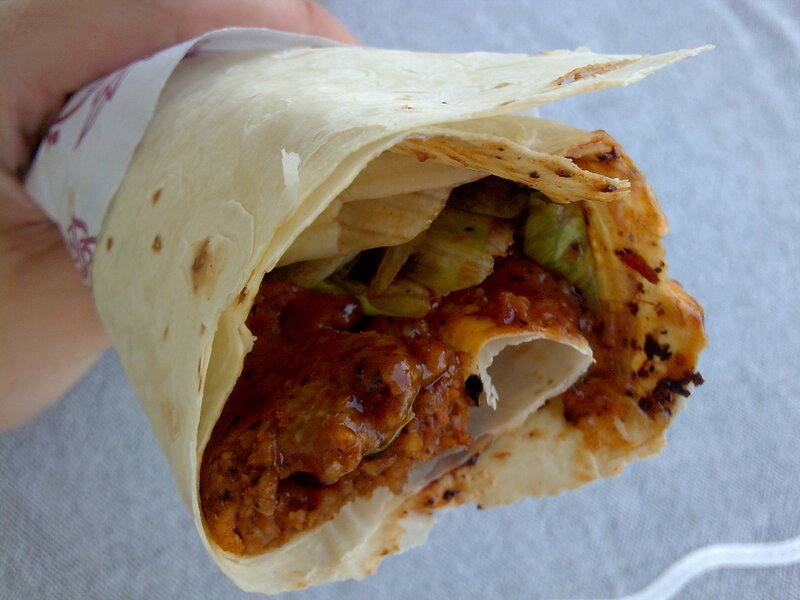 Doner image by Tripadvisor user. While the above may be the most popular and filling, the below are a couple of personal favorites. Here is another must-read personal Istanbul food recommendations by blogger Adil Musa. 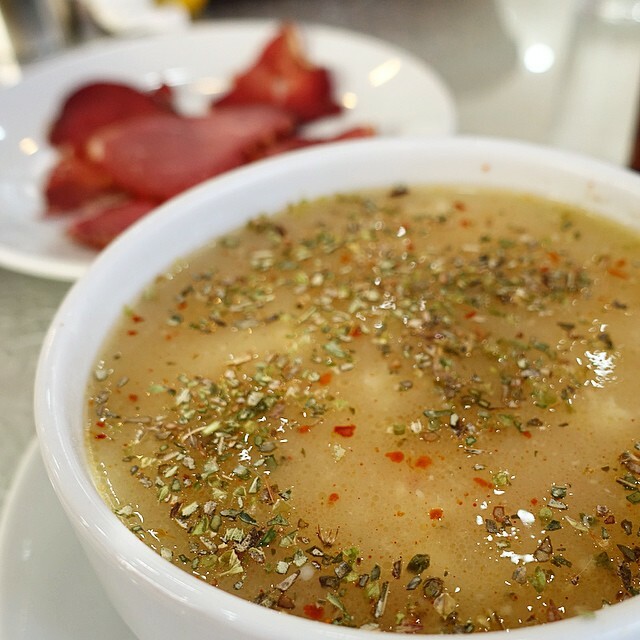 This is a soup that people generally drink (as is said in Turkish) after a hard party. If you’re with locals and you go to eat something at 5am, you’re most likely to end up at an işkembe place. It might not be to everyone’s taste though as it is made of tripe, and usually topped with melted butter, vinegar and garlic. It is said to prevent hangovers. Turşu is a popular Balkan and Middle Eastern method of pickling different types of seasonal vegetables. The most popular vegetables for Turşu are cucumber, carrot, cabbage and beets. It is a tradition in Turkey to make your own Turşu for winter. It is actually a popular food which goes very well with many dishes. Locals even love to drink the juices. If you find this article helpful please share with your friends!